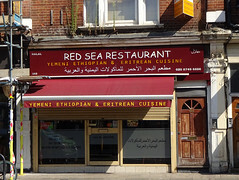 Small restaurant in Shepherd's Bush, offering Ethiopian, Eritrean, Somali, and Yemeni food. It's cafe-style in decor, and seats only around 40 people. When Kake and friends visited on a Wednesday lunchtime in June 2012, we were the only customers aside from one or two people coming in for takeaway. The restaurant was quite dimly lit — I'm not sure they even turned the lights on at all, and we were seated towards the back, away from the windows. Service was friendly, and they were happy to bring us tap water. Ye-tsom-beyaynetu (£7) photo, from the "Abyssinian dishes" section of the menu, was described as "a variety of vegetarian dishes including chick pea, lentil and yellow pea sauces and a selection of vegetables", and was noted as being suitable for vegans. The price included portions of five dishes — yellow split peas, green lentils, spicy split lentils, potatoes with carrots, and spinach — as well as injera to eat it with and a side salad. The dishes were all well-flavoured, with the spinach being a particular highlight, and overall the portions were satisfying. The chilli level was pretty mild in most of them, with only the spicy lentil stew being even slightly warming to Kake's palate. The injera was nicely sour, as it should be. They are not licensed to serve alcohol, but they do have a few interesting soft drinks on the menu, including Shani and "banana with milk". The abovementioned ye-tsom-beyaynetu was not the only vegetarian dish on the menu — there was also the vegetarian ayab-be-gomen (home-made cheese and spinach with injera) and the vegan shirro wot (a hot and spicy stew made with chickpea powder), as well as a few starters such as hommous and moutabal. The majority of the menu is quite meat-heavy, though given the quality of the vegan food we tried, vegans and vegetarians should be fairly happy here. Not sure of the full opening hours, but on the Wednesday of our visit they opened at 12:30pm. Kake's verdict: I'd happily come back. This is very well-priced food for the quality. Accessibility: A large step to get in, but it's on one level apart from that. Access to the toilet (a single, reasonably sized, unisex cubicle) is via a fairly narrow passage with a 90-degree turn at the end. Last visited by Kake and friends, June 2012. Last edited 2018-08-07 15:11:53 (version 4; diff). List all versions. Page last edited 2018-08-07 15:11:53 (version 4).